Most air conditioning systems in Southern California are centralized, which means they use a single unit to cool the air, then blow it into your home via a system of ducts. The vast percentage of So Cal homes were built after the advent of air conditioning, which means they are built to accommodate such ducts, and centralized systems usually do their job cheaply and efficiently. But what if your home was built earlier than that, and can’t accommodate the ducts necessary for centralized air? Or even worse, what if your home can support centralized air, but it remains an inefficient and supremely problematic system? 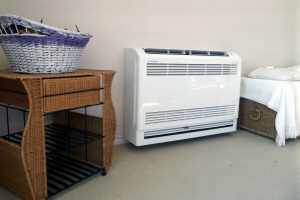 For those homes, the options can include ductless HVAC systems, which we highly recommend as a means of comprehensive heating and air without having to depend on a system of ducts. How do they work and what kind of benefits do they provide? We’ve provided a brief outline below. As you may have suspected, ductless systems don’t rely on ducts to carry the conditioned air through the home. Instead, they set up multiple smaller air conditioning units at key points throughout your home. Each unit needs to cool just one section of the home, and each one can have its temperature adjusted individually: separate from the rest of the home. Why Is That Preferable to Centralized Air? No Ducts. Homes that can’t support a ducted system often have to limp along using box air conditioners and portable models. Ductless systems provide comprehensive coverage to every corner of the home without the need for ducts. Individual Cooling Experiences. Say you’re cooking in the kitchen. The heat of the stove raises the temperature there without affecting the rest of the house. With a centralized system, you’ve either have to put up with the heat or lower the temperature in the rest of the house such that remaining family members are unduly chilly. The precise control afforded by ductless systems allows that to happen quickly and easily. Lower Cooling Bills. By extending that premise, the biggest asset to owning a ductless system becomes clear. You can simply turn off the air in parts of the home that aren’t being used – upstairs bedrooms during the day, for instance – while still running it in parts of the home you are using. That can cut down on monthly summer air conditioning bills immeasurably, while still allowing your family to enjoy cool and comfortable temperatures at home whenever they need it, no matter how hot the weather gets. It also reduces wear and tear on the system, helping it last longer than a centralized unit might. For quality ductless air conditioning installation, repair and maintenance throughout Whittier, CA, call Greenleaf Heating & Cooling today!